The evolution of the modern truck design has been to increase cab space and keeping the same wheel base, leaving us with a shorter bed.Because the wheel base remains the same, and the cab got longer, the distance from the cab to the center of axle became much shorter. So much so that fifth wheel towing is not considered possible by the manufacturers of this truck type. And who can blame them when fifth wheel trailers are at least 96” wide, which means that while turning, 48” of the trailer’s width is swinging toward the back of the cab, which is much less than 48" away. Luckily, PullRite and Hijacker have both created their version of a solution to this problem. PullRite's SuperGlide #3100 and Hijacker's 13k Auto-Slide, both have auto-sliding capability to move the trailer away from the cab while making turns without the need to stop, slowing down or even think about the space between the truck and the trailer. And when the turn is complete, the auto-sliding feature returns the hitch and trailer to the safe towing position over the truck axle. 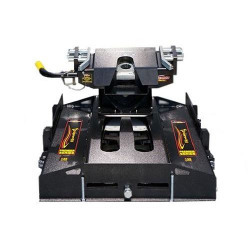 Before making your purchase, ensure the 5th wheel hitch will provide the clearance you need on turns without making contact between your cab and trailer. To do so, either measure or consult your manual to get the length between your cab and axle, and deduct half the width of your trailer. When towing with a 5.5FT bed, this number will result in a negative cab clearance, which will provide the amount of clearance required by your 5th wheel hitch to generate on turns to avoid contact. Also to note, many trailers have contoured nose caps to make them more aerodynamic, but more importantly to reduce the trailer width and increase cab clearance. As you can envision, you may see the trailer nose cap overhang the king pin in the middle, but at the corners they're behind the king pin. The corners of a trailer within cab height are the contact points you should be most concerned about as they will make contact much quicker than one without their corners removed and contoured. 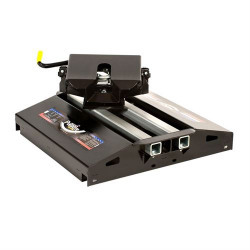 Aside from the 5th wheel hitch itself, strictly speaking you will need our recommended vehicle-specific installaction brackets and a capture plate to activate the auto-slide. The only exceptions are, if you install the Hijacker above bed system, it may be installed on other branded industry standard rails and brackets. Furthermore, a Hijacker capture plate is only required for aftermarket pin boxes / couplers.